Few factors impact driver and passenger safety more than driver visibility, and the best way to ensure safe driving is to have a clear and unobstructed view through the windscreen. Studies show that the majority of motorists’ driving decisions are based on how well they can see the road, and driving in poor weather conditions, such as rain, sleet, hail or snow, significantly increases the risk of collision. That’s where the innovative MICHELIN Stealth Hybrid wiper blade can make the difference between clear and safe – or unclear and unsafe. 1. Riveted smart hinge delivers optimum wipe performance by holding down each end of the wiper on the windscreen. 2. Smart Flex secondary system ensures better windscreen contact across the entire length of the wiper blade. 3. Spring-loaded technology provides enhanced responsiveness across the windscreen. 4. A durable cover protects the blade from ice, snow and road debris, helping to extend blade life. 5. EZ-LOK connector system means blades are quick and simple to install in minutes – so driver safety is never compromised. 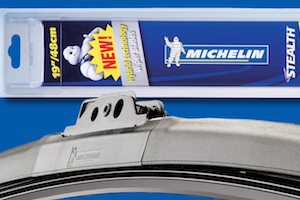 Specifying MICHELIN Stealth Hybrid wiper blades is a powerful opportunity for garages to maximise both sales and customer satisfaction. As more and more OEMs move to hybrid blades, MICHELIN is the brand that consumers know and trust to deliver superior performance and quality. The sleek, modern styling of the Stealth Hybrid wiper blade appeals to consumers, making it a smart choice for customers and a more profitable opportunity for garages.